You might use your garage only for parking the car, but most likely you also use it to store all sorts of belongings and gardening equipment, and your kids probably use it as a play area too. Ensuring that all members of the household understand the risks and always follow safety precautions is paramount in order to avoid potential injuries. Since the 1990s all garage door openers have been required to include two important features – an automatic reverse mechanism and photo eye sensors. The first will prevent the door from closing if it encounters resistance, i.e. touches a car, a person or any object, while the latter consists of two sensors, one transmitting an infrared light beam to the other. If something blocks the beam, the door will stop and open back up. Although meant for mostly for storage purposes, the large empty space often entices kids to use it as a play area. Teach your kids a few safety rules that will help them avoid the risk of injury. First and foremost - the door is heavy, so they shouldn't play near or under it. Secondly – the garage door is a main entrance pointy to the house so all security rules that apply to the front door apply here as well. Don’t run in and out while its opening or closing; Don’t press the remote or the wall switch repeatedly; Make sure the door is closed at night; Never give anyone the code for the keypad. Testing the safety eyes involves placing an obstacle between the sensors and attempting to close the door, which should reverse immediately. If it doesn't, there is an urgent need for sensor re-alignment, which ideally should be done by a professional. 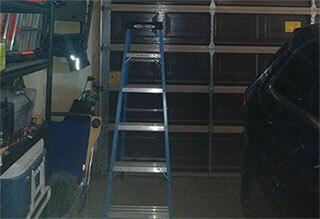 Testing the automatic reverse system is similar, except that the obstacle should be placed in such a way that the photo eyes won't detect it and the door will be forced to connect with it upon its descent. In case the door doesn't reverse as it encounters the object, the force limit setting needs to be adjusted, as per the manufacturer's instructions. The best way to identify a potential problem is to keep a regular maintenance schedule. The weight of the door and the continuous strain on the opener and springs ultimately result in wear and tear, so don’t wait for serious problems to arise and conduct regular inspections and have professionals like our experts deal with any issues you discover.